The New York Times reported today that a sequel is in the works to Oliver Stone's 1987 film Wall Street. Sort-of. This new film, titled Money Never Sleeps, will be a Gordon Gecko story. 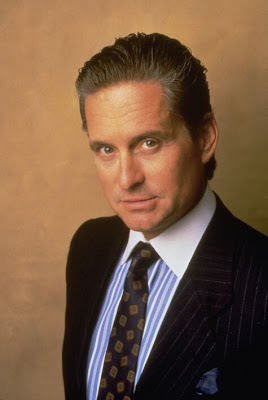 Gecko, played by Michael Douglas in Wall Street (who won an Oscar for the role), was an icon of the excessive '80s thanks to his materialism and his motto, "Greed is good." Besides the hokey title, this just sounds like a bad idea. Gecko was/is a character that was singular in '80s cinema, and his persona worked well in the context. While it'll be nice to see Douglas playing a sonofabitch again, the idea of revisiting Gecko isn't the way to do it. He should exist as this great relic of a bygone era, not mined for a possible franchise of films. Oh, and Oliver Stone has no involvement despite months of Douglas and the producers and writer of Money Never Sleeps trying to get him on board. Stone has made some iffy decisions of late in his work, but avoiding this greedquel is probably a great idea.